Angela and Tam are the Head of Extended Language and Learning, and Alternative Pathway Coordinator of Nexus International School respectively. Nexus International School support learners with moderate to mild learning differences both in the primary and secondary schools. Through integration of ICT they produce and promote engaging and imaginative lessons, creating opportunities for Nexus Learners to access the curriculum in new and innovative ways. Both teachers advocate a strong belief that education is as important in the home as it is in school and welcome you to join them to share their knowledge of how to use technology to promote learning. 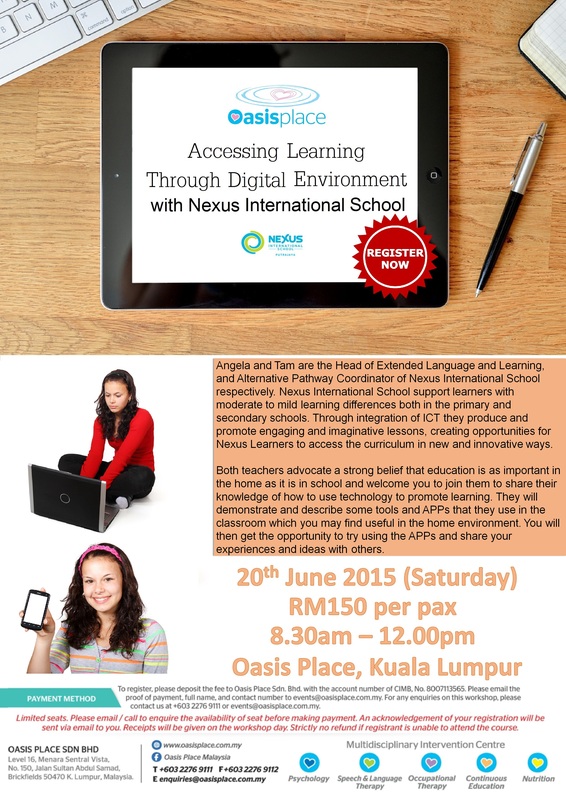 Through this interactive workshop, they will demonstrate and describe some tools and APPs that they use in the classroom which you may find useful in the home environment. You will then get the opportunity to try using the APPs and share your experiences and ideas with others.